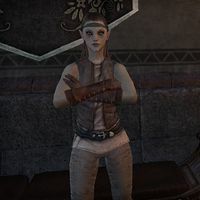 Tirvina Avani is a Dunmer who can be found in the Saint Olms Waistworks in Vivec City. She sits in the hallway outside the Tailors and Dyers Hall. Tirvina is a member of a family of researchers, much to her chagrin. "I won't go back! She can't make me go back! Can she? Oh no." "Are you here about the job I posted? I doubt you'll want to go through with it once you hear the details." I've already accepted the job, actually. "You have? You really want to fight that thing? I don't care if these ruins contain the bones of Lorkhan himself, I'm not going back until that monster is gone. But hey, if you want to fight a Daedra and grab a few pointless relics for us, feel free." What's special about this ruin? "In my opinion? Probably nothing. We'll translate a few tablets, clean up some bones, guess as to who owned the place. We'll find a useless detail to insert into a dull chapter of a pompous book no one will read anyway." Can you tell me about the Hunger? "Hungers are Daedra associated with Boethiah. This one was likely summoned by a cultist centuries ago. They are—as the name denotes—very hungry, especially for mortal flesh. I prefer pastries. I wouldn't fight one, but you seem more than willing." You don't seem very enthusiastic about your research. "Finding useless ruins is the family business. My own mother currently heads our research team. She insisted I put the notice up, if you must know. Honestly, if it was up to me I'd be a fat, happy baker right now. Instead I'm just a scrawny coward." "Let me guess, you ran away? Honestly, I can't blame you." I dealt with the Hunger. "You—you actually did it? You defeated the Hunger? I'll be honest, I didn't expect that. Thank you for the help! We'll be sure to contact you if any other horrifyingly grotesque creatures show up. Maybe I should start saving up for that bakery." "You have no idea how thankful I am. That thing still haunts my nightmares!" A large family by the name of Avani make their living in Davon's Watch as various smiths and artisans. It's unknown if Tirvina is a member of this same family. This page was last modified on 12 February 2019, at 00:56.